While transporting waste to the landfill in Cornwall, Ontario, I viewed a bird different from the seagulls and turkey vultures normally seen. I had to capture a picture so people would believe me! 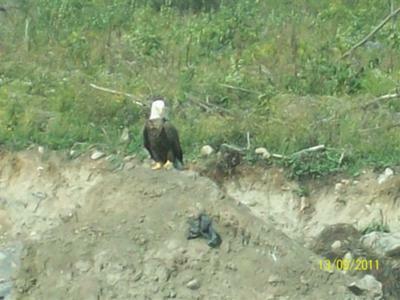 This eagle was seen at 2:30 pm on Tuesday September 14th, 2011 at the Cornwall Landfill on Cornwall Centre Road. 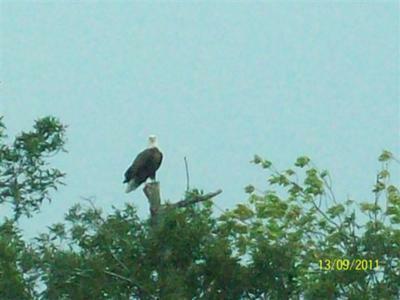 This is my first sighting of an Eagle, which are very rare in this area. 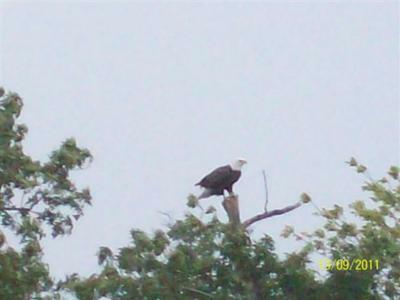 Thank you so much for this report of your Bald Eagle sighting, and also for the great pictures, I know our readers will be delighted to know that there are Eagles in the Cornwall area! Clearly watched a Bald Eagle flying over the east end of Cornwall, Ontario, on Sunday March 9, 2014. I did not have a camera handy to take a picture.